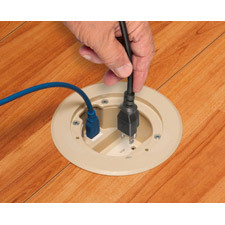 Arlington’s cULus Listed FLBC4560D IN BOX™ Cover Kits are the best way to install receptacles in a 4.5"concrete box. 1/8” covers in brass or nickel-plated brass and in plastic in gray, caramel, black, brown and light almond install into the box, reducing trip hazards caused by plugs. Easy to install, kits include a divider for power and low voltage in the same box.